Bernard Morin (1933-): French mathematician. François Apery: models of the projective plane, page 104. Morin's surface is an immersion of the sphere that comes up in the central phase of the process of turning a sphere inside out imagined by B. Morin and J.P. Petit (cf. the above article). J.P. Petit's drawing opposite shows its topology. The sphere initially had a face colored in grey and a face colored in orange. The swapping of the two faces occurs during the central phase of the process by a simple rotation by . For n = 2 et k = 1, the above parametrization provides a model (the case n = 3, k = 1 gives Boy's surface). Opposite, a polyhedral version of this surface owed to J.P. Petit. Another version is owed to Richard Denner (see the links above). 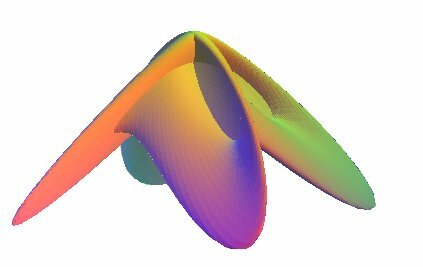 Apery's parametrization provides a family of surfaces with rotational symmetry of order n; opposite the case n = 5.